On August 4, 2009, the principals of boutique real estate brokerage Morgan Lane acquired the assets of GMAC/Brookfield-owned Pacific Union, in what some onlookers termed a “David and Goliath” endeavor. The move was greeted with skepticism that the resulting firm could even survive the real estate slump, much less prosper and evolve. Mark A. McLaughlin, CEO of Pacific Union International Inc., reflects on the 2009 decision. As we observe Pacific Union’s fourth anniversary, we’re of course extremely happy with how the business has performed and grown. But we’re even prouder of our culture, which has fostered our success. “Our driving principle of ‘managing to the top’ and investing in our people and business helps us attract and retain some of the best, brightest, and most successful real estate professionals in the Bay Area,” says McLaughlin. In just the past four months alone, Pacific Union reached a number of regional and national milestones. In April, our year-over-year sales increased 46 percent to $3.9 billion to position us as the third-largest brokerage in Northern California, according to the San Francisco Business Times. Later in the month, RISMedia named Pacific Union to its list of Top Power Brokers, placing the firm 18th in the country in 2012 total sales volume. In May, REAL Trends ranked Pacific Union third in the U.S. in average home sales price at just more than $1 million, making us the second-fastest-growing company in the nation. The overall numbers are a reflection of our real estate professionals’ expertise and drive to excel. REAL Trends found that Pacific Union’s real estate professionals were among the most productive in the nation, ranking fifth in sales volume per professional with an average of $8.1 million in closed sales in 2012. And in July, eight of our real estate professionals were ranked among the top 250 in the U.S. by The Wall Street Journal and REAL Trends. While 2013 has brought industry recognition to both Pacific Union and our team of professionals, the firm has been steadily building momentum over the past four years. In fact, we’ve increased our market share by double-digit percentages in every region where we had a presence in 2010. The growth was most dramatic in Sonoma County, where we increased our market share by an impressive 181 percent. Pacific Union also enjoyed large market-share gains in Contra Costa and San Francisco counties. 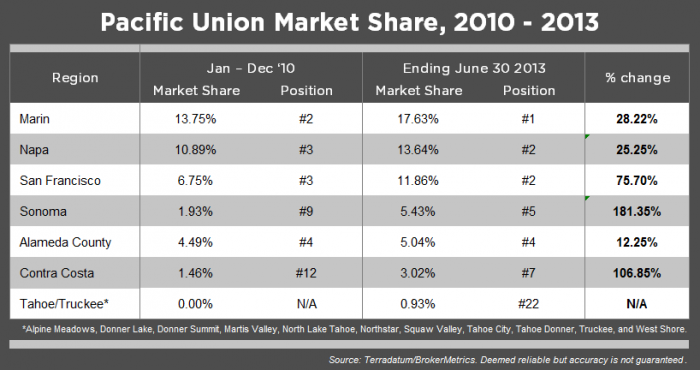 In terms of market share, we now occupy the top-five list in six of our eight regions (including Sonoma County and Sonoma Valley) and are coming on strong in our newest market, the Tahoe/Truckee area. It will be fascinating to reflect on our growth in Sonoma County and the Tahoe/Truckee regions at this time next year. Along the way, we will commence operations in San Mateo and Santa Clara counties. Several of our real estate professionals who were with Pacific Union before the acquisition compared the before-and-after mindsets. They observe that while the company culture has always been supportive and friendly, it has been taken to another level in the past few years. Steve Gothelf, who was recently ranked 44th in the U.S. in sales volume, points to the firm’s level of support and leadership as its two strongest cultural attributes. Newcomers to Pacific Union are also bullish on the culture. Nina Hatvany, who ranked 23rd in the nation in sales volume in 2012, cites the company’s people as a key factor that influenced her decision to begin working with Pacific Union in January. “It’s a very collegial and collaborative atmosphere with a lot of information sharing,” she says. Pacific Union’s emphasis on people and culture has played a major role in both its low turnover rate and its headcount growth. McLaughlin notes that while most real estate brokerages have a churn rate of more than 20 percent, Pacific Union has lost fewer than a dozen professionals in the past four years. In that same time period, the number of real estate professionals affiliated with Pacific Union has grown from approximately 400 to 520, or a 30 percent increase.